A castle in County Armagh has been sold by the government for just £1,000. Gosford Castle, near Markethill, is in a poor state of repair and has been bought by a development company which plans to turn it into private homes. 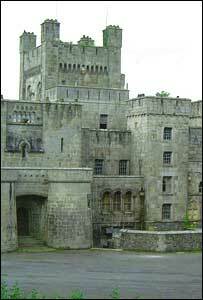 The estimated £4m repair bill will be footed by Gosford Castle Developments, chosen by a government-appointed panel. Agriculture minister Lord Rooker said the deal they had made would secure the restoration of Northern Ireland's largest Grade A listed building. Lord Rooker said that "after a difficult era", the future of Gosford Castle was "looking bright again". "This will be good news for County Armagh as a whole," he added. "The project has the potential to give a boost to business in Markethill and the wider rural area as a spin-off from the construction activities to be undertaken at the castle." Gosford Forest Park will still be open to the public while the work is carried out.